PLAYLIST of how the Europeans ruling powers of local government and parliament have been overruled by the unelected EU bureaucracy. To understand how the world is shaped, read the Jesuit Order. 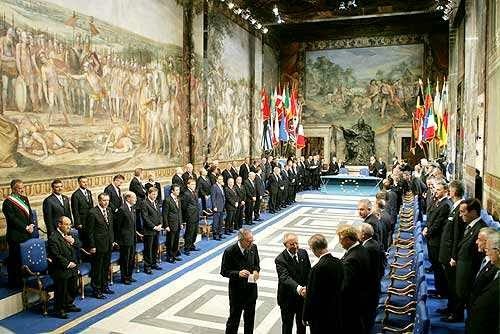 Signing of the Treaty of Lisbon was held in the 15th century Jerónimos Monastery. do you see what is at the background ? Pope Innocent X status. "Under the Lisbon Treaty the European Council would become a formal institution with the power of appointing the Commission, it could be said that the two bodies (European Commission, European Council) hold the executive power of the Union." There are 43 aspects of running a country or membership of the EU that will be voted on using QMV from 1st November 2014. 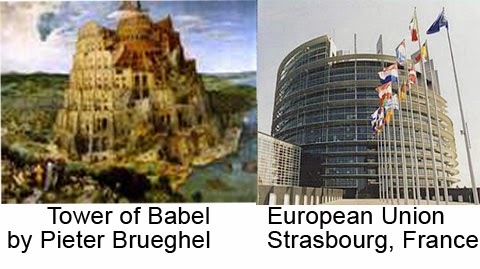 These areas of power will no longer reside in Westminster, but instead will be in Brussels. Quantitative Majority Voting. No individual country of the 28 member will have a veto in these matters. Thus a positive vote on any of the 43 areas can be imposed on any individual country even against the wishes of it's sovereign parliament. No law can be enacted that has any bearing on any of the 43 aspects of government without the approval of the EU by majority voting of other members voting for it. We could be asked to drive on the Right and there is nothing we could do about it. But that is a trivial matter compared what could be pushed our way, against our national interests. These measures make the Westminster Parliament toothless and effectively impotent to carry out policy changes, amendments, or repealing etc. on all of those items. A brief review of the Treaties confirms the Transitional arrangements which allow, only on specific votes, for the Nice Treaty Provisions to apply from 1st November 2014 until March 2017, hence I imagine PM David Cameron’s determination to delay our referendum beyond that date, tying Britain for ever within the non-democratic, totalitarian and now clearly despotic EU. Other EU members countries are all affected,here is dutch article.